1. The incumbent CEO refuses to cooperate. No CEO ever really wants to replace him- or herself. However, CEO succession is the board’s responsibility, not that of the incumbent CEO. 2. Boards do not proceed pregressively and step-by-step. Boards skip steps or, worse yet, allow emotion, preference, capture, social relationships, or bias to creep in. 3. There is no actual CEO succession plan. Every board should have an emergency CEO succession plan and a longer-term plan. The longer-term plan contains a line of sight for the Board to: the high potential talent pipeline; what grooming and development is necessary to make this talent CEO-ready; and what the time frame and resources are for this readiness. Internal CEO talent costs less than external talent and is more successful. •	Updates to full Board on all of the above. •	Resist the use of technology simply because it is available. The litmus test for technology is performance. •	Lay down the rule if you are the board chair or professor: No technology unless it is directly related to the meeting. And lead by example. •	Make sure all discussions, agendas and information are relevant, to respect your audience’s time, and resist their temptation to be distracted. •	Insist on full preparation and focus on the discussion. The discussion is where the learning and important decisions get made. •	Have students submit 2-page summaries of the readings at the start of class, to validate their preparation. •	The foregoing would be draconian for directors, but it is blindingly obvious to directors who is prepared for the meeting and who is not. Have a system to enforce preparation. •	Insist on peer assessment of directors and students. •	Make sure that you can see someone’s eyes. If you cannot see their eyes, chances are they are distracted. •	Take frequent breaks to use technology for personal purposes. •	Insist on in-person meetings to the fullest extent possible. •	Self-police any errant director or student who cannot comply with the above. •	Most of all, lead by example. When a regulator advises corporate directors that progress on gender diversity is “simply not good enough,” that is code that the status quo will not continue, and that more regulation may result. And the second wave of regulation is often worse than the first. Regulators have limited levers at their discretion. They are not going to come into boardrooms and assess performance. Thus, they are tending to land on numbers: ranging from 9-10 years for director tenure and 25% – 50% quotas for women. Canadian regulators have adopted a flexible and progressive ‘comply or explain’ approach to director term limits and gender diversity. The progress recently reported is, in a word, inadequate: Only 19% of boards surveyed have term limits; only 14% disclose written diversity policies; and only 7% have targets for women on their board. Our comply or explain regime has the disadvantage of permitting explanations that are irrelevant or spurious, such as targets for women not being adopted because candidates are selected based on merit, as if both goals are mutually exclusive. There is not an excuse for inadequate governance progress that I have not encountered. But the real reason for the above low figures, which is not in the public domain, is self-interest. Why would any director, particularly an over-tenured male director, agree to a policy that moved him out of the boardroom? Directors speak in code publicly, but in private interviews, many open up. I had a 28-year director tear up when I recommended a 12-year term limit for his board, without grandfathering. The academic evidence in favor of director term limits and diversity is becoming more clear: Diverse groups make better decisions. And over-tenured directors are worse for innovation and shareholder value. Regulators – in several countries – are acting. Regulators want independent directors who are the most qualified sitting in boardroom seats. As they should. In Canada, regulators have not imposed quotas or term limits, but these should not be ruled out if inadequate progress continues. Regulators have asked boards to articulate their own numbers, and why that number works for them. Do not misjudge the regulator, or the importance of gender diversity for the new federal and the current provincial Liberal governments. Tone-deaf boards should listen. Act on conflicts of interest. If a tenure or diversity policy affects one or more of your directors, excuse these directors from the room. They should not influence the decision. Do not assume director consensus. There are directors who believe that other directors have outlived their usefulness and should be replaced. Land on a target. If your board has zero women, start with one woman as your target. Targets should be aspirational and dynamic. If you think 9 years is too low for director tenure, choose 12 years. 15 years is on the high end, and companies are landing on 12, particularly large, complex companies. But pick a target. If you do not pick a target for director tenure, then you best have a rigorous and consequential peer director assessment regime, whose output is actual director resignations. The evidence is that many boards do not have or do this. Do not assume that your board can draft an inadequate tenure or diversity policy, and that this will go unnoticed. The regulator is offering guidance and examples of robust policies. Own the policy. Draft the policy yourself, or have an independent advisor assist you. Management or company advisors are not independent. They work for you and have a vested interest in keeping you satisfied. Watch for past practices that might bias women, including assertions that your talent pool is shallow. If your talent pool are directors whom you know, rather than the best directors available, then you best enlarge your talent pool. Regulators are giving you an opportunity to craft policies that work for you. Do so. No director is irreplaceable, and directorships are not lifetime appointments. 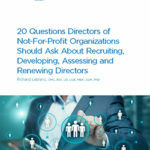 But if you believe a particular director’s tenure is advantageous, use average director tenure or have exceptions built into a policy to give you degrees of freedom. The regulatory evidence, above, is that boards may be incapable of changing from within. As such, regulators will act when boards do not. 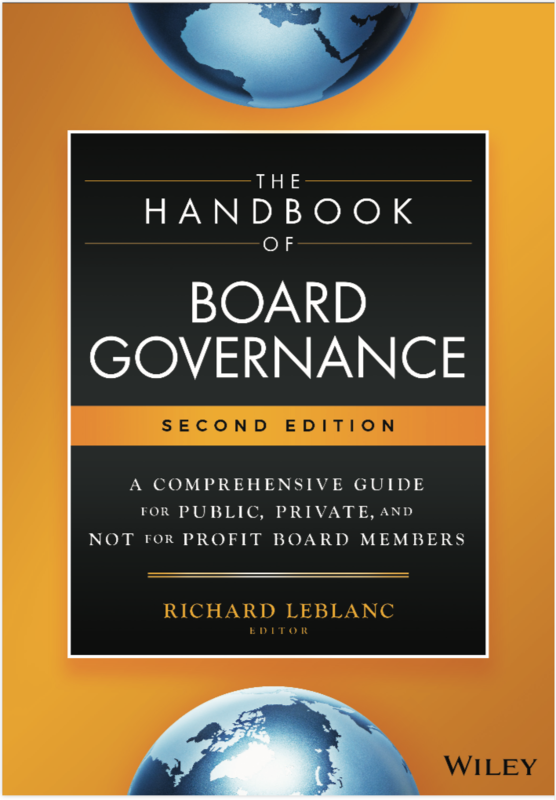 Richard Leblanc is a governance consultant, lawyer, academic, speaker and advisor to leading boards of directors. He can be reached at rleblanc@boardexpert.com or followed on Twitter @drrleblanc.